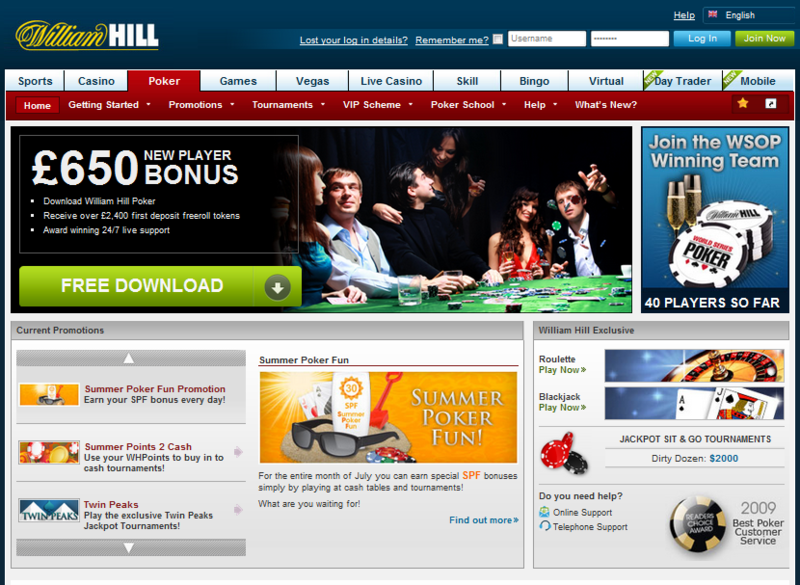 William Hill is one of the oldest and largest bookmakers in the world, offering offline and online gambling services since 1934 and are one of the most trusted names in the gambling industry. They are one of the largest sites on the iPoker Network, the biggest online poker network in the world. They offer a huge 200% match up to $2,000 first deposit bonus, have a lucrative VIP scheme and have tournaments with combined guaranteed prizepools of $20,000,000 each and every month! William Hill are also publicly listed on the London Stock Exchange. 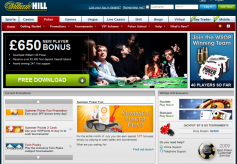 William Hill are offering PokerNetwork customer a massive 200% up to $2,000 first deposit bonus. All players have to do is download William Hill Poker through PokerNetwork and for every 350 WH Points earned $5 will be released from the bonus. Players have 90 days to clear the full bonus amount. Points are earned by playing in real money cash games and tournaments, at different rates depending on the currency played in and the amount of rake taken. It is possible to earn up to 45 WH Points per £1 in tournament fees and up to 48 points per hand at the cash game table (if the maximum rake is taken). William Hill also have a fantastic VIP Scheme that rewards their loyal customer base. It has ten levels depending on how many WH Points a player has earned with each level awarding even greater benefits, such as $1,000, $3,000 and $10,000 freerolls and even live tournament sponsorship! 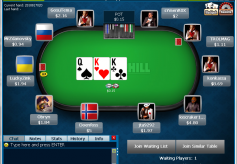 William Hill applies a 'no flop, no drop' policy which is common across a number of online poker rooms, meaning if the hand is settled before the flop is dealt no rake is taken. For the most part the rake is set at 5% and is capped depending on game type, limit level and number of players involved. For No Limit and Pot Limit tables, the rake is capped at $3 up to $10/$20 and moves to a cap of $5 for levels $25/$50 and above. 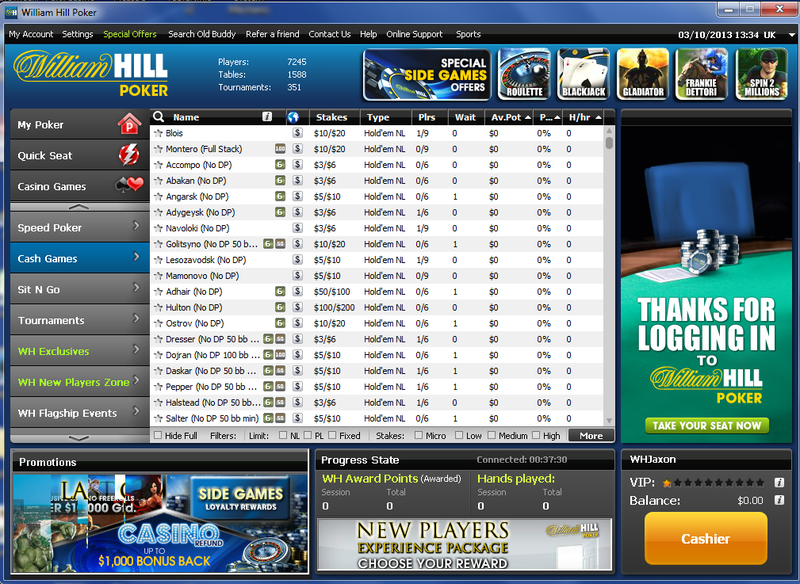 William Hill are a member of the vast iPoker Network, the largest online poker network in the world. During peak times, 1900 GMT to 0000 GMT, they regularly have 6,500 real money cash game players at their tables with the weekly average being around 4,000. Most of the traffic is concentrated around the six-max No Limit Hold'em cash games but there is also significant traffic at the short handed Pot Limit Omaha cash tables along with frequent action in Omaha Hi/Low, Fixed Limit Texas Hold'em and even Seven Card Stud. 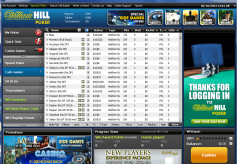 William Hill Poker uses a gaming platform developed by the highly respected software developer Playtech, giving the players the very best gaming experience possible as this is one of the best poker software’s on the market. The graphic runs smoothly without any interruptions or hiccups. In the lobby you have a numerous of filters and functions available so that a player, with a few clicks will be able to find exactly what they are looking for, no matter what level or game type. 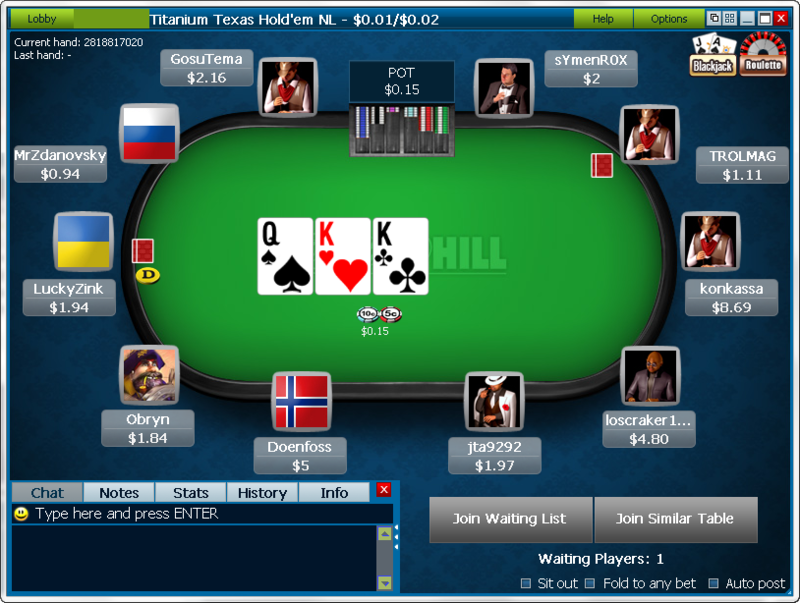 This together with the smooth blue color at the tables and in the lobby, clear and large buttons, four colored deck make grinding at William Hill Poker a pure joy, without putting a strain on the eyes. William Hill has a large amount of sports bettors that transition over to poker, making it one of the easiest online poker sites. Resizable Tables – Adjust the size of your tables, making playing multiple tables easy. Auto Top-up – Have the software automatically reload your stack in cash games to maximise your potential profits. Player Notes – Easily create and manage notes on all your friends and foes. Hand strength indicator – Allow the software to display your hand strength so you never fld a winning hand again! Game History – Upon request, your entire game history can be sent to you, or view your recent plays in real time. Buddy system and player search – Keep track of your friends and the fish with a unique buddy system and player search facility. Full Screen Option – Maximize your experience by using all the computer screen. William Hill award winning support is available 24-hours a day, seven days per week through their live-chat client, email or toll-free phone numbers. Have a look at the Speed Poker tables! Now available on Mac too!